While enrolment in Modern Languages courses at secondary school and university has been in decline for more than a decade, the number of pupils attending supplementary (weekend) language schools is rising. Yaron Matras, who leads the Multilingual Communities strand of the AHRC-OWRI consortium Cross-Language Dynamics: Re-Shaping Community, calls for a research and public engagement strategy that embraces community language initiatives, and for a national language policy that gives more attention to the domestic arena. Read the full text here. Abstracts are invited for an inter-disciplinary conference on “Rethinking Language and Community: Diversity in Global Settings”, which will take place on 16 and 17 May 2019 at The University of Manchester. The purpose of this conference is to explore and discuss different and new ways of understanding ‘community’ in its relationship with language, and to critically assess the notion’s relevance in times of superdiversity. We aim to bring together PhD students and early career researchers working on the topic or related aspects from across disciplines, including language, linguistics, literary and cultural studies, film/media studies, area studies, migration studies, human geography, ethnography and anthropology. Abstracts of 250-300 words (excluding bibliography) should be sent to mlm@manchester.ac.uk by 22 March 2019. Please use ‘Community Conference 2019’ in the subject heading and include authors’ names, affiliation and contact details in your abstract. 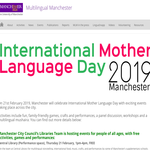 On 21st February 2019, Manchester will celebrate International Mother Language Day with exciting events taking place across the city. Activities include fun, family-friendly games, crafts and performances, a panel discussion, workshops and a multilingual mushaira. An online programme, with more details of the events, is available here. Being Part of the City: Multilingual Manchester was edited by Matylda Wierietielny, a graduate of the University’s Granada Centre for Visual Anthropology, who created the concept together with the MLM research team.